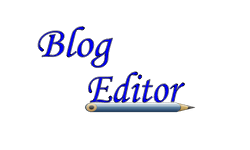 During weekends, I am making varieties of poori for our breakfast and I have been sharing the same in my blog. Last Sunday I prepared this paneer( Indian cottage cheese in English) poori for our breakfast with the leftover paneer cubes. 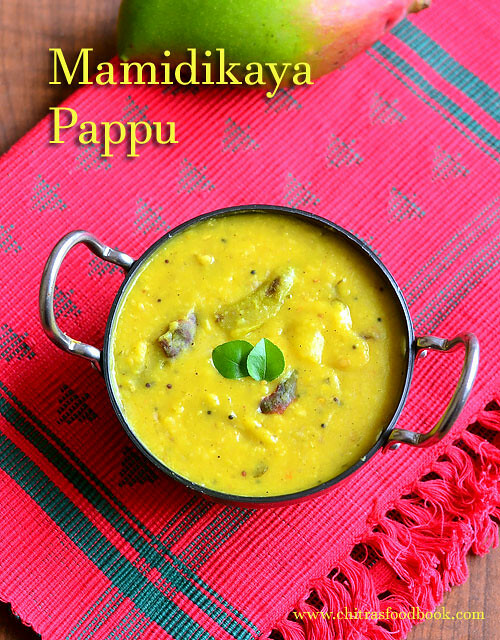 When I was searching for different types of puri recipes, I saw this one in Ramki’s one page cookbook. I liked the idea of paneer stuffed poori and tried this recipe in my own way. It came out really well, puffy and soft. 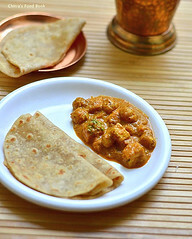 Even though it tastes like masala poori, Paneer gives an additional softness to it and make it healthy too. 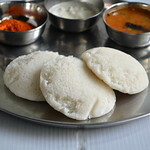 Semolina/ Rava helps to keep the poori puffy and hold its shape for long time. So kids would love it for sure. 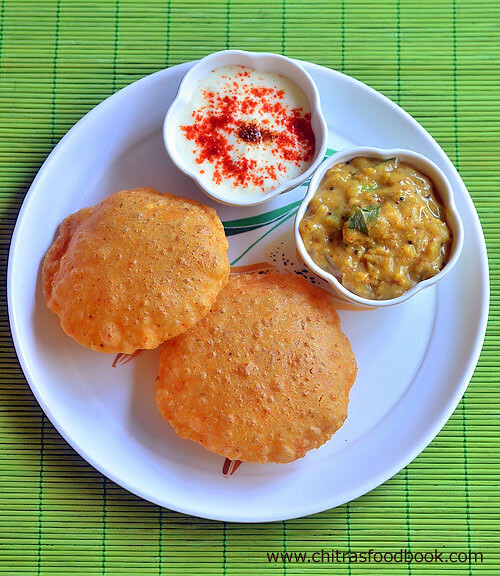 Do try this different type of poori during this vacation for your kids and family.Enjoy the breakfast ! I made masala raita and onion masala as side dish for this poori. 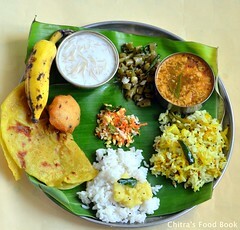 It was a good combination.You can make tomato bhaji, potato masala or even chana masala as a side dish. 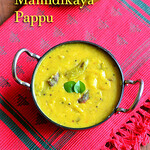 Ok, Lets see how to make yummy, soft paneer poori with step by step photos and a video ! Grate the paneer using a grater and measure 3/4 cup from it.Keep aside. 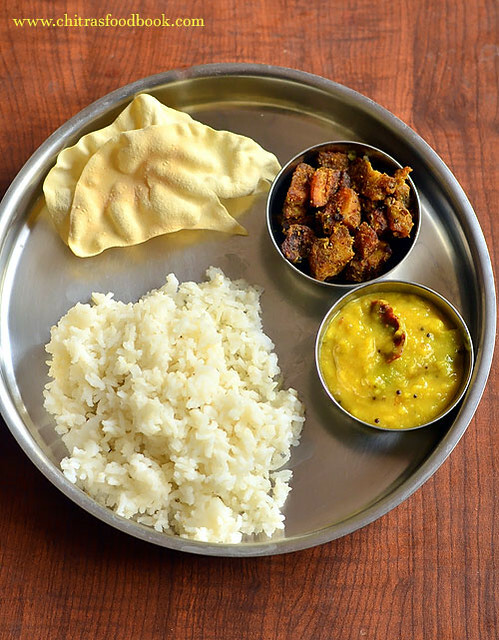 In a wide bowl or plate, take the wheat flour, besan flour, rava, salt, red chilli powder, garam masala powder, ajwain/Omam OR cumin seeds and grated paneer. Mix everything well without adding water. Mixture looks crumbly. Now add water gradually and make a smooth dough.Dough should not be too hard or too sticky. Knead it for 5 minutes. Make poori immediately. Keep the remaining dough covered while rolling the poori. Take a portion of dough and make uniform sized balls. Dust the ball in wheat flour and roll into small thick poori. Remember thin poori won’t puff up.So roll it thick. Refer picture below for thickness. Heat oil in a kadai to deep fry. Check its temperature by dropping a pinch of dough. If it rises to the top immediately, oil heat is just right. 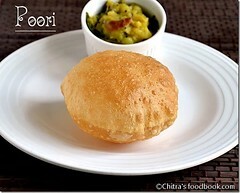 If the heat of oil is less, poori won’t puff up. So check it before deep frying. Reduce the flame to medium and take one rolled poori. Pat it between your palm to remove the excess flour. Drop the poori in oil. When it starts to come up, press the poori with a ladle gently. It puffs up well. Now flip the poori and cook for a minute till bubbles cease. Remove & drain in a tissue paper. 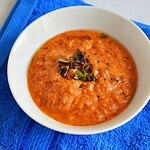 Serve hot with masala raita and some bhaji/Poori masala. TIPS: Increase the flame to high till you drop the next poori. Reduce the flame to medium as soon as u drop it. You can follow this to maintain the heat throughout deep frying. If oil becomes smoky hot, switch off the flame for few minutes. 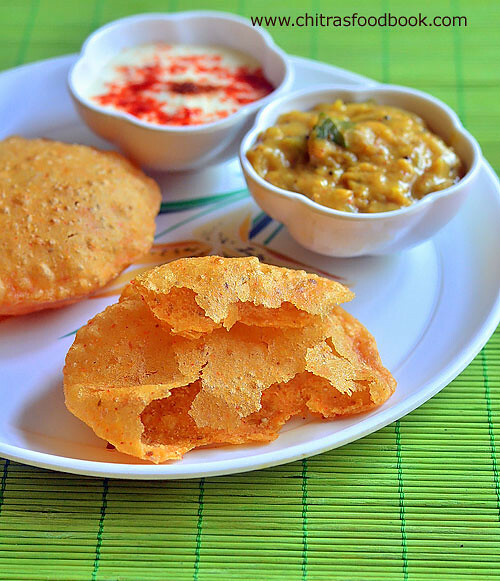 After the oil comes to desired temperature, fry the poori. Do not make the dough too sticky or soft. No need to rest the dough. 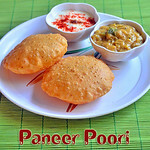 Make poori immediately to prevent oil absorption. Thickness of poori is very important to puff up.So roll it small and thick. Heat of oil is also an important factor for puffy poori. Check its temperature. Oil should not be smoky hot. 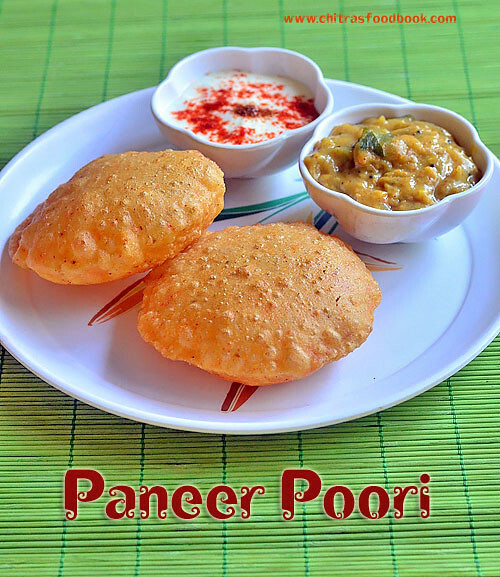 Try this yummy paneer poori at home for your weekend breakfast and enjoy ! 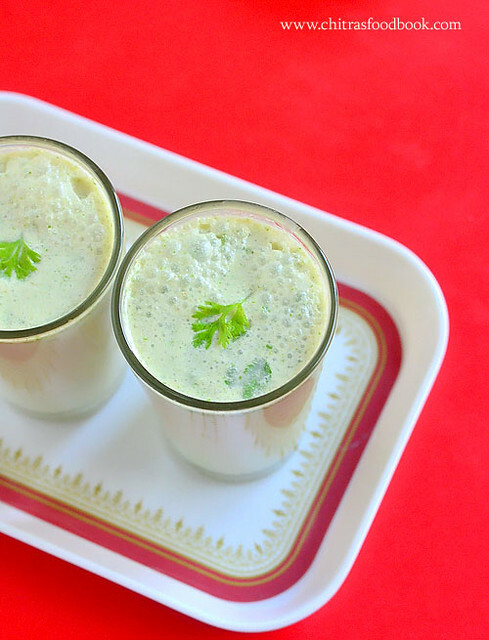 When we think about thirst quenchers for summer, the simple and the best coolant that strikes our mind is buttermilk. Its an awesome summer drink that provides lots of health benefits to our body. 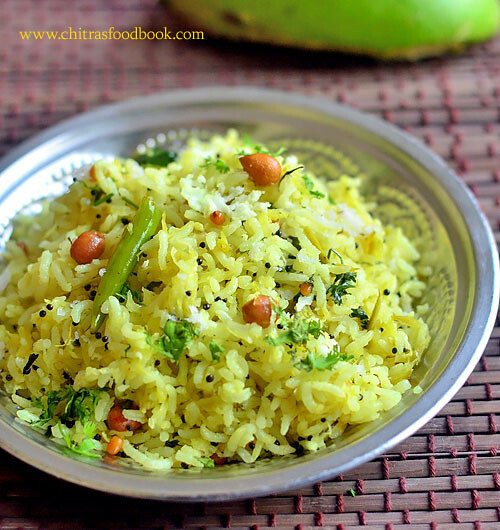 In South India, Tamil nadu we never fail to make neer mor during summer. Sendhil & Raksha likes to have spiced buttermilk instead of taking curd rice. 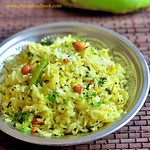 But I love to eat creamy curd rice with raw mango or baby mango ( Vadu mangai) pickle . 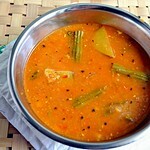 So I make South Indian neer mor almost everyday in summer just for them. Recently I tasted this North Indian style spiced buttermilk (“Chaas/Masala Chaas” or masala taak in Hindi ) in a lunch buffet. As it was kept in a mud pot and served chilled, I loved it very much and had 3 servings even after having a tummy full lunch . 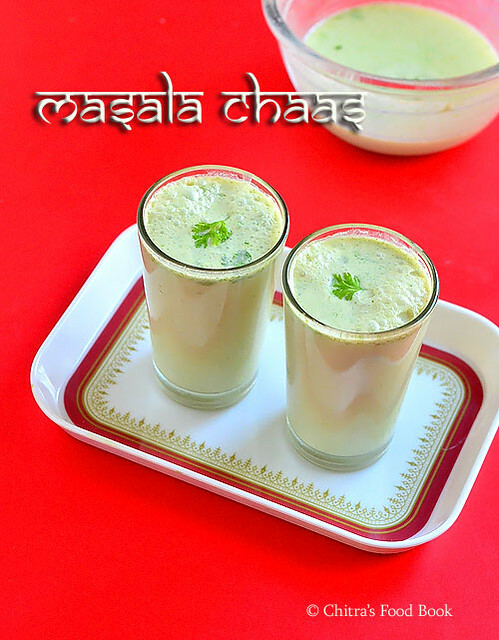 I wanted to try this simple and yummy chaas at home for a change. I browsed for the recipe and tried at home. Roasted cumin seeds powder( Bhuna jeera powder) and black salt are the star ingredients of this basic plain chaas recipe apart from fresh yogurt/curd. To make a spicy masala chaas, green chilli, ginger, coriander leaves can also be used along with cumin powder and black salt. 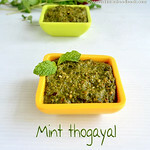 For variations, mint leaves/Pudina, hing and even black pepper powder can be used. A pinch of chaat masala can also be added for that extra punch. 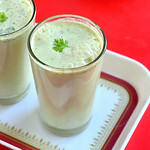 Ok, lets see how to make this North Indian special summer drink, Masala chaas recipe with step by step photos ! Check out my Summer Recipes in THIS LINK ! In a mixie jar, take the green chilli, washed coriander leaves, roasted cumin powder, black salt and curd.If you wish, u can add 1/2 inch ginger piece, 1/2tbsp mint leaves while grinding. Grind it to a smooth paste. If you don’t have mixie, use a whisk and beat well. Transfer the ground paste to a bowl. Add 2.5 to 3 cups of ice cold water.Mix well. Check for taste and add more salt and cumin powder if needed. 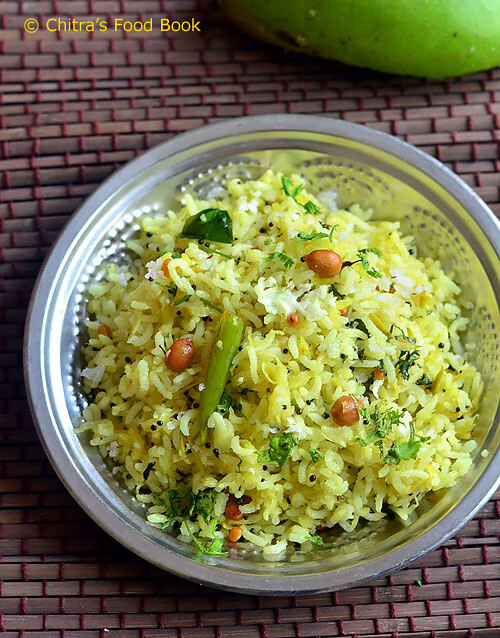 Garnish with finely chopped coriander leaves and sprinkle a pinch of cumin powder. 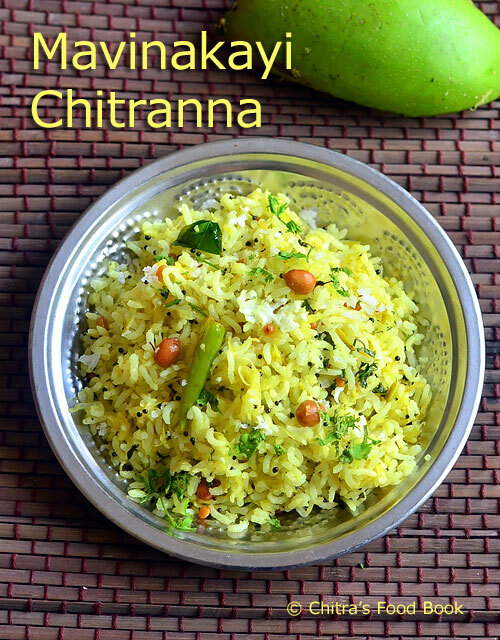 Serve immediately or refrigerate it till use and serve chilled. Enjoy ! Adjust the quantity of cumin powder and black salt as per taste. Adjust the quantity of water based on the consistency and taste. For variations, u can grind a small piece of ginger too. You can also add a pinch of chaat masala at the end before serving. Always serve it chilled to enjoy its best taste. 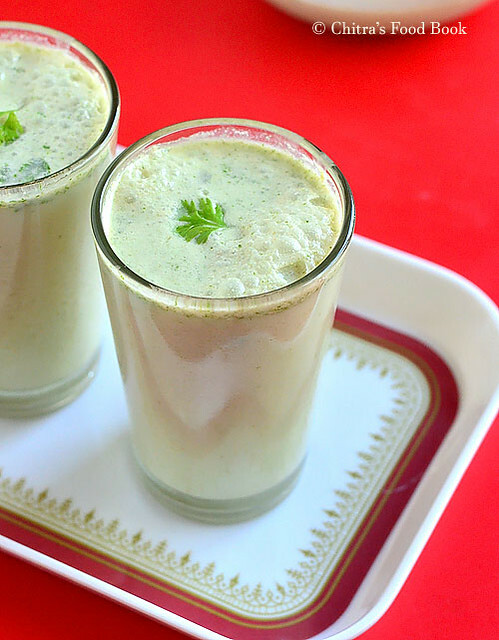 Try this easy, North Indian style masala chaas at home and enjoy after a heavy meal. It helps in quick digestion ! Every Thursday and Friday , I perform Guru Pooja and Mahalakshmi Pooja at home. 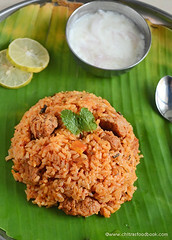 Usually I make Payasam/Kheer or sweet pongal for neivedyam/Prashad. As I am bored of making the same, I am trying out easy sweets recipes like burfi, halwa for every week pooja. Check out my earlier posts suji ka halwa, atta halwa, bread halwa and carrot halwa. Last week Thursday,I prepared this beetroot halwa for the first time following my carrot halwa recipe using pressure cooker. As I did not have Khoya/mawa or condensed milk in hand, I just used milk and sugar. It came out really well. This halwa takes less ghee and sugar unlike other halwa recipes. Still it tasted rich, looked colorful and shiny. Sendhil & Raksha loved it a lot. I am sure kids would love to taste this halwa just by seeing its color.Overall its a healthy and nice alternative from the carrot halwa/ Gajar halwa. But remember to add the right amount of ingredients mentioned in the recipe. Adding more sugar makes the halwa hard like burfi. Stirring the halwa for long time makes it chewy. This halwa thickens as it cools down. Keep these points in mind and start making it. 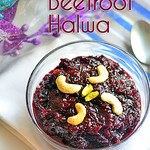 You can make a perfect beetroot halwa ! Beetroot halwa stays good for a week when refrigerated. 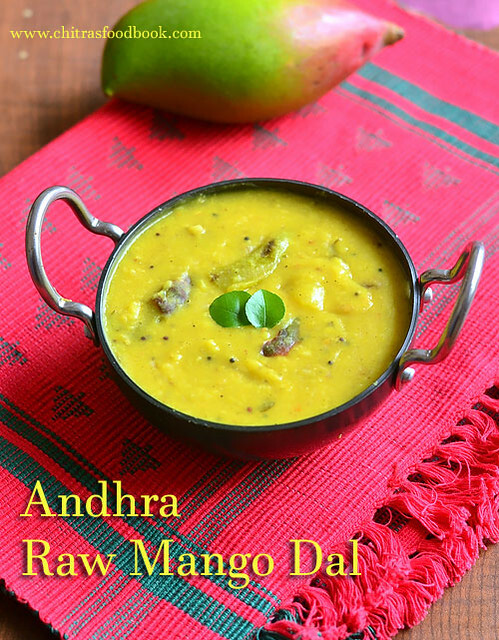 You can serve it chilled or reheat for few seconds in a microwave oven or a kadai with little ghee to serve it warm. It tastes really great when served warm with a scoop of ice cream. 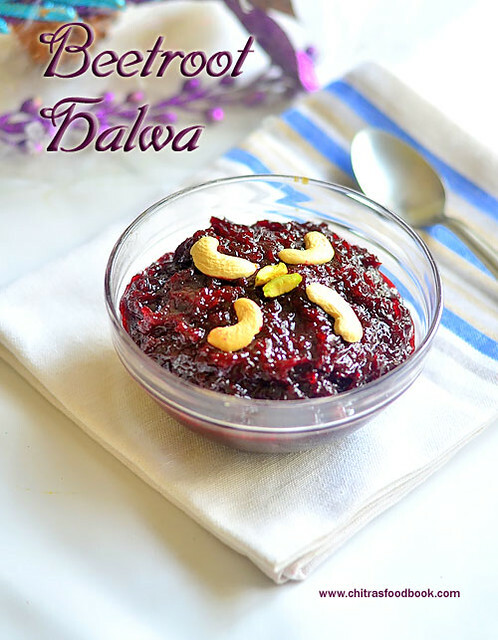 Now lets see how to make this yummy, easy, colorful , healthy, Indian dessert recipe –Beetroot halwa with step by step photos and a video ! 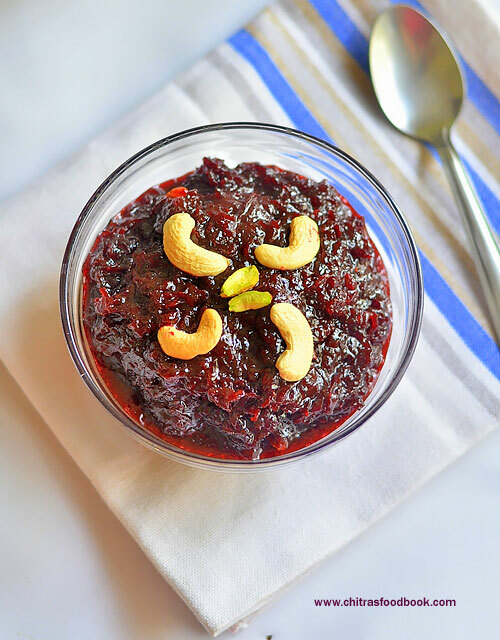 How to make beetroot halwa in a pressure cooker just by using milk and sugar ! Wash 2 big sized beetroot, slice the top and bottom portion and peel its skin using a peeler. Grate it using a big holed grater. If we use small holed grater, beetroot becomes mushy after cooking and resembles jam. So I always prefer big sized holes for grating. Measure it after grating and keep 3 cups ( loosely packed) aside ! In a pressure cooker base, heat 1.5 tbsp of ghee. Add the grated beetroot and saute till its raw smell goes off completely & beetroot turns pale in color. It takes 7 to 10 minutes. Now add the boiled milk( at room temperature) and add a small pinch of salt. Addition of salt helps to enhance the sweetness of halwa. Mix well and pressure cook in very low flame for 3-4 whistles. It takes nearly 15 minutes. Open the cooker after the steam is released. Boil till 3/4th of the excess milk gets absorbed by the halwa.When the halwa starts to become thick, add sugar. Mix well till sugar melts. The mixture will become watery. Keep mixing in medium to high flame till the halwa starts to leaves the sides and bottom of cooker. Stay nearby and keep mixing else halwa may burn in the bottom. This process takes more than 20 minutes in medium flame. When the halwa becomes thick, glossy and leave the sides of cooker, reduce the flame to low and keep mixing for one minute. Halwa leaves the pan completely and gathers in the center. Switch off the flame and remove the cooker from the stove. It looks moist now. Let the halwa be in cooker for few minutes.In the mean time, roast the cashews. Heat the remaining 1.5 tbsp. ghee in a kadai and roast the cashew nuts till golden. Add it to the halwa in the cooker. Mix well and transfer the halwa to another bowl. Halwa looks slightly moist and sticky when hot. As it cools down, it becomes thick and set well. Original taste and sweetness of this halwa can be known only after it becomes warm. If you want more sweetness, heat halwa & sugar in a kadai and Consume after it becomes warm. 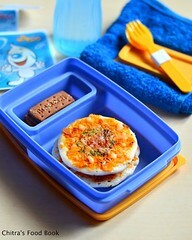 You can even refrigerate the halwa for an hour to serve chilled ! I like to have it warm with a scoop of ice cream! Tastes yummy !!! This halwa stays good for one day without refrigeration.But it stays good for 3-4 days if stored in an air tight box in a refrigerator. Use clean spoon for handling ! Reduce the quantity of sugar if the beetroot is too sweet. But do not add more sugar than the mentioned quantity. Halwa may become hard like a burfi after mixing. Mix the halwa till it becomes thick and leaves the sides of pan. It will thicken as it cools down. Adding cardamom powder helps to give a nice flavor. Do not avoid it. If you want to add condensed milk, reduce the quantity of sugar or skip it completely. You can add sugarless khoya at the end, mix well and remove the halwa. It makes the halwa more rich in taste ! 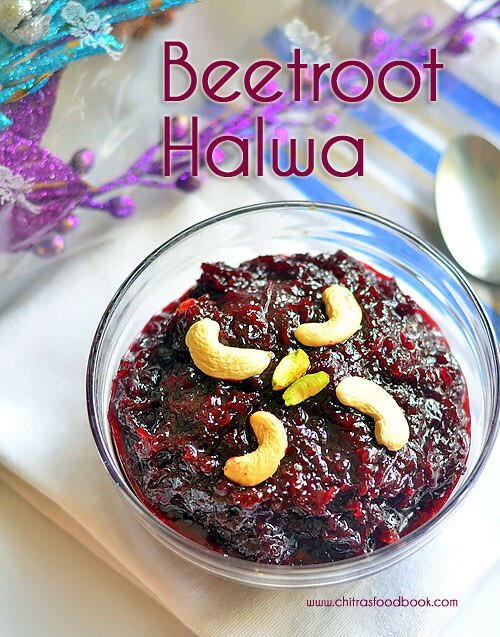 Try this easy, yummy beetroot halwa for festivals and occasions. You will love it !